Chris Foss Trading Cards, #21-40 (1995) | 'TAIN'T THE MEAT… IT'S THE HUMANITY! Published by FPG in 1995 Chris Foss Fantasy Art Trading Cards was a collection of 90 base cards and six chase cards that featured the work of the popular science fiction artist. This post showcases cards #21-40, while the first 20 cards can be found here. 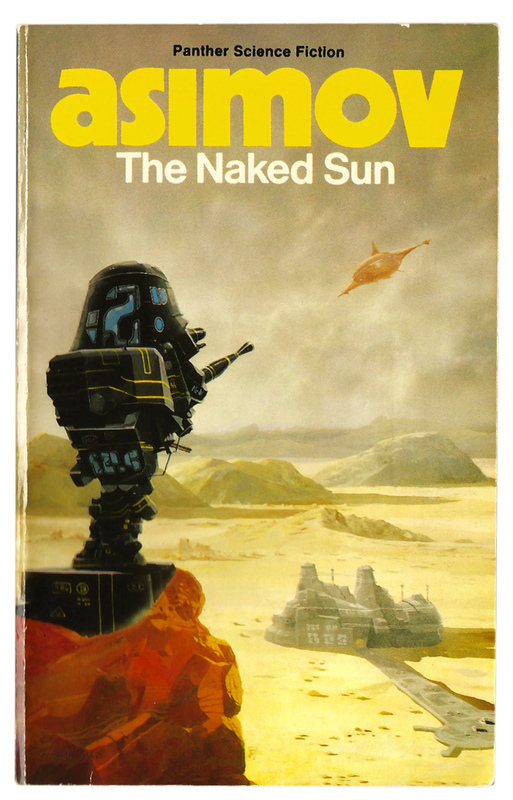 During a career than has spanned 50 years Foss has illustrated hundreds of book covers for some of the biggest names in science fiction. He has also worked as a concept artist on films such as Ridley Scott’s Alien, Alejandro Jodorowsky’s failed Dune project and he recently worked on Guadians of the Galaxy for director James Gunn. 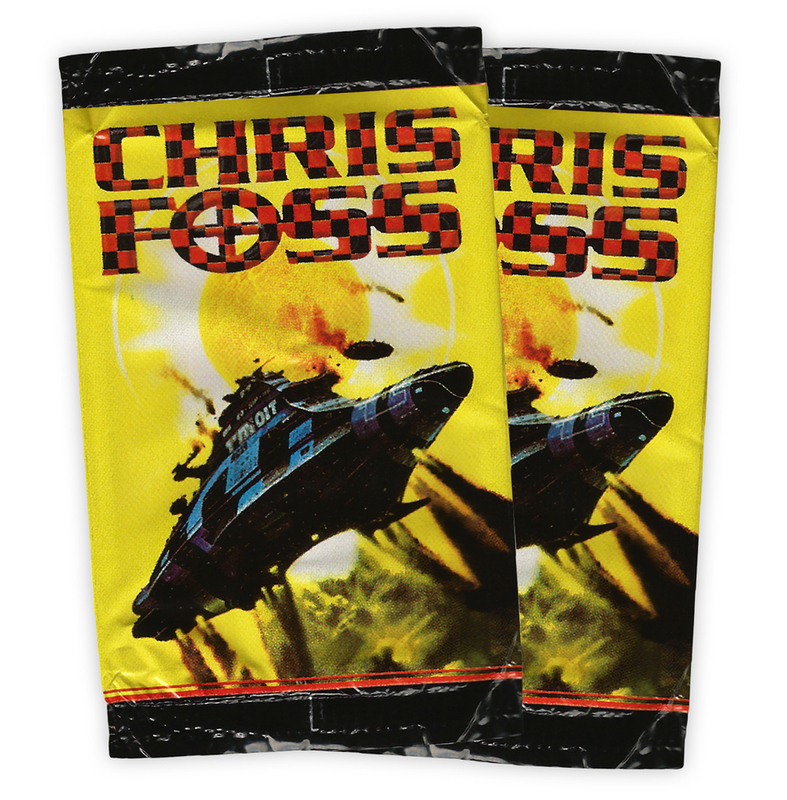 Chris Foss Trading Cards featured 90 full-colour base cards, five metallic chase cards (1:12) and an ultra-rare foil-stamped autograph card (limited to 100 copies). Each card measured 90 x 65mm, was printed on thick card stock and shipped in packs of 10 (the packet is shown above). There are some great paintings in this second batch of cards. Card #22 featured the cover to Isaac Asimov’s The Stars Like Dust (one of my all time favorite Foss paintings) while #25 shows the cover to The Early Asimov Volume 1. Card #24 featured a gorgeously insect-like spaceship taken from the cover of Chris Boyce’s Catchworld, while #28 shows another classic Asimov cover, The Naked Sun. Lastly there’s card #32 which shows a wonderfully oversized combine harvester, originally published as the cover to Keith Robert’s The Grain Kings. In my first post I registered my disappointment with FPG’s decision to feature fictional captions on the reverse of each card instead of biographical information. My annoyance with that lost-opportunity continues with this second catch of cards – how great would it have been to have Foss describe the creative process that went into each painting? Other trading cards, such as those featuring Frank Frazetta and Bernie Wrightson, featured useful information on the reverse of each card so it’s a pity the Foss cards didn’t follow suit. Even the names of the cards is non-sensical. Card #22, the aforementioned The Stars Like Dust is instead titled The Star Rail Project, presumably because the spaceship featured on the card looks a bit like a length of railway track! Here are the second 20 cards from the Chris Foss Trading Card collection, both front and back. I’ll post cards #41-60 in the next week or so. Click on each card for a larger version. Card #28: Is There Anybody Out There?